The first recorded match of women's cricket was reported in The Reading Mercury on 26 July 1745, a match contested "between eleven maids of Bramley and eleven maids of Hambledon, all dressed in white." The first known women's cricket club was formed in 1887 in Yorkshire, named the White Heather Club. Three years later a team known as the Original English Lady Cricketers toured England, reportedly making substantial profits before their manager absconded with the money. In Australia, a women's cricket league was set up in 1894, while in South Africa, Port Elizabeth had a women's cricket team, the Pioneers Cricket Club. In Canada, Victoria also had a women's cricket team that played at Beacon Hill Park. In 1958 the International Women's Cricket Council (IWCC) was formed to co-ordinate women's cricket around the world, taking over from the English Women's Cricket Association, which had been doing the same job in a de facto role since its creation 32 years earlier. In 2005, the IWCC was merged with the International Cricket Council (ICC) to form one unified body to help manage and develop cricket. 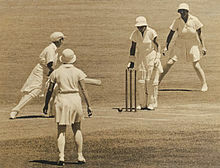 Women's cricket has been played internationally since the inaugural women's Test match between England women and Australia women in December 1934. The following year, New Zealand women joined them, and in 2007 Netherlands women became the tenth women's Test nation when they made their debut against South Africa women. Since 1973, women's One Day Internationals (ODIs) have also been contested, and these quickly became the focus of women's international cricket. In the years since the inception of women's ODIs more than eight times more of this format has been played than women's Test cricket. The Women's Cricket World Cup has been held nine times, with Australia, England and New Zealand sharing the titles. In 2004, a shorter format still was introduced, with the introduction of women's Twenty20 International. Initially, women's Twenty20 cricket was played little at international level, with only four matches played by the end of 2006. However, the following three years saw a rapid growth, with six matches been played in 2007, ten in 2008 and thirty in 2009, which also saw the first ICC Women's World Twenty20. Since 2015, women have played franchise ticket in the Australian Women's Big Bash League. In 2016, the semi-professional Women's Cricket Super League formed in England and Wales. ^ Judy Threlfall-Sykes (October 2015). A History of English Women’s Cricket, 1880-1939 (PDF) (Thesis). p. 55-56. Retrieved 29 July 2016. ^ Buckley, George Bent (1935). Fresh Light on 18th Century Cricket: A Collection of 1000 Cricket Notices from 1697 to 1800 AD Arranged in Chronological Order. Birmingham: Cotterell. ^ "The History of the SA & Rhodesian Women's Cricket Association". St George's Park. Retrieved 2010-02-09.